I'm hoping I've figured this out correctly but just wanted to run it past someone. When I was taking the cylinder head off, I had removed the tensioner but the timing chain was still on. I was still moving the number 1 piston TDC on compression when one or both cams rotated because of valve spring tension. Originally, I had been planning to lock the camshafts in the camshaft housing. Anyway, fortunately nothing bad happened to the valves then but I need to make sure the cams are in the right position. The intake cam seems obvious to me with the notch extension on top (or slightly rotated to the intake side) but the exhaust cam has several marks that I can't figure out. There is an E with a dot next to it and an I with a dot next to it. I'm guessing Intake and Exhaust? Then, there is a slash or small line. This slash is the only mark exactly on a sprocket tooth so I'm guessing this is the valve timing mark that goes with the single colored link in the chain. With both marks in their upper positions, the number 3 intake valves would be fully extended which works as that piston is at the bottom of its cylinder. Also, the number 4 exhaust valve springs may be partly compressed. I guess the next question would be whether the engine is interference or not. I did notice some small notches in the piston tops for valves which would accommodate valves. I was kind of concerned about the partial extension of the valves in number 4 but they are probably not far enough in to matter. Sorry to bug you again but I've put enough effort into this that I don't want to mess up at the end, assuming I haven't already. Here's a bit from the repair manual. If you don't have the whole manual at hand, though, I would encourage signing in so you do; there's a lot of info scattered through there about what to do and not do with the lock pin in the timing adjuster, and so on. 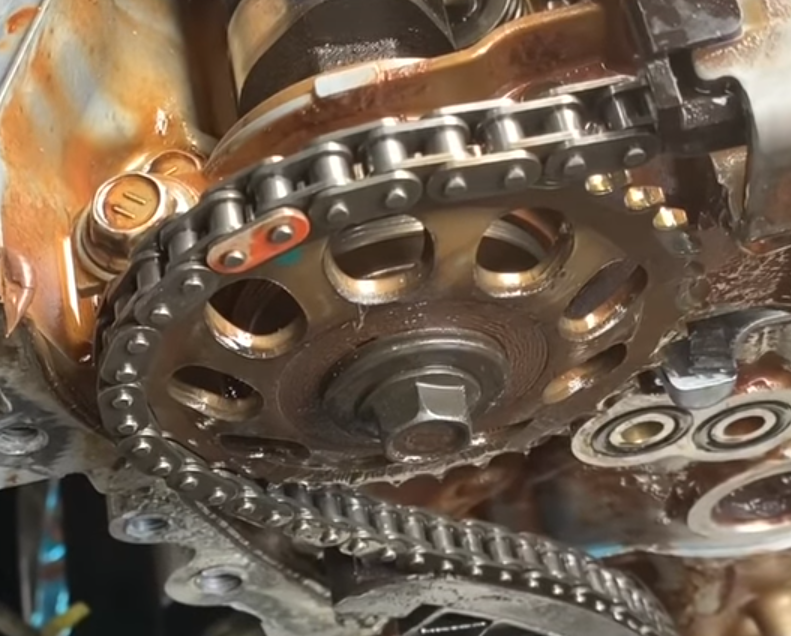 I've been hoping somebody will post the number of links in the timing chain, in case you have the cover off and you can count them. The number isn't in the book. It's easy to find good enough online pictures of the sprockets to count their teeth, and knowing the number of chain links too would make it possible to do the math to tell people (if they don't have the timing cover off) how many crank revs they might need before the colored links show up in the right spots. The number of links between the timing marks would is good to know. In fact, it's 10.5 links between the chain marks or 6 5/8 inches between the indicated sprocket teeth. Assuming the exhaust mark is at 1 degree (about vertical) the intake sprocket mark is at 39.5 degrees. If the crankshaft pulley alignment key is at 0 degrees, I'm thinking that should be the number 1 TDC configuration. The chain is well marked with a yellow link indicating the crankshaft sprocket position, a single orange link indicating the exhaust camshaft mark, and 2 adjacent links indicating the intake sprocket mark. You could simply count links between the colored ones and then links between the sprocket marks if you were not able to crank the engine for some reason. I'm guessing there are about 55 links in the chain so that it might be necessary to crank it 55 revolutions. On the timing adjuster, I did see a good youtube video on that and believe I have that part figured out. In any event, I always turn the engine gently by hand through several revolutions just to be sure nothing's messed up in there, even if I'm confident everything is in place. This video may help you, he shows in detail the alignment marks. Also, for next time, a tip for locking the cam shafts, preventing them from rotating. Robert Holt and Raytheeagle like this. I'm guessing there are about 55 links in the chain so that it might be necessary to crank it 55 revolutions. So the links-in-chain question is still out there, for anybody who has one handy and doesn't mind counting them. Nice framegrab, thanks! I've counted (outer plates) a couple different ways now and got 70, anybody else get something different? So 140 rollers. Are these needed? The Timing chain cover is back on? 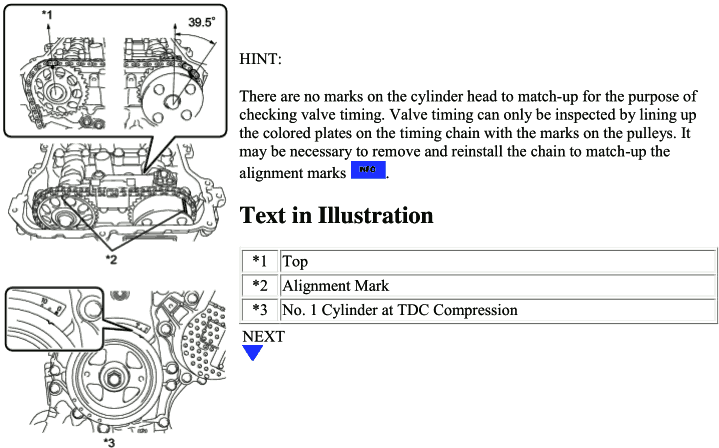 In the video, they say it takes something like two or three revolutions to get the marks aligned. That's assuming no misaligned cams. There's pics in the pdf too. The intake cam uses the double link, and the exhaust cam uses the single. The crankshaft must be correct if the cams are correct. It takes 10 revolutions to bring the marks back around if I remember correctly. I rotated mine until I saw the links lined up two more times. Just to make sure nothing slipped. KInd of a funny angle on the cam sprocket, but I'm pretty confident that's 18 teeth on the crank sprocket, which would make 36 on the cam. Yeah, does look like 36 on the cam, funny angle and all. 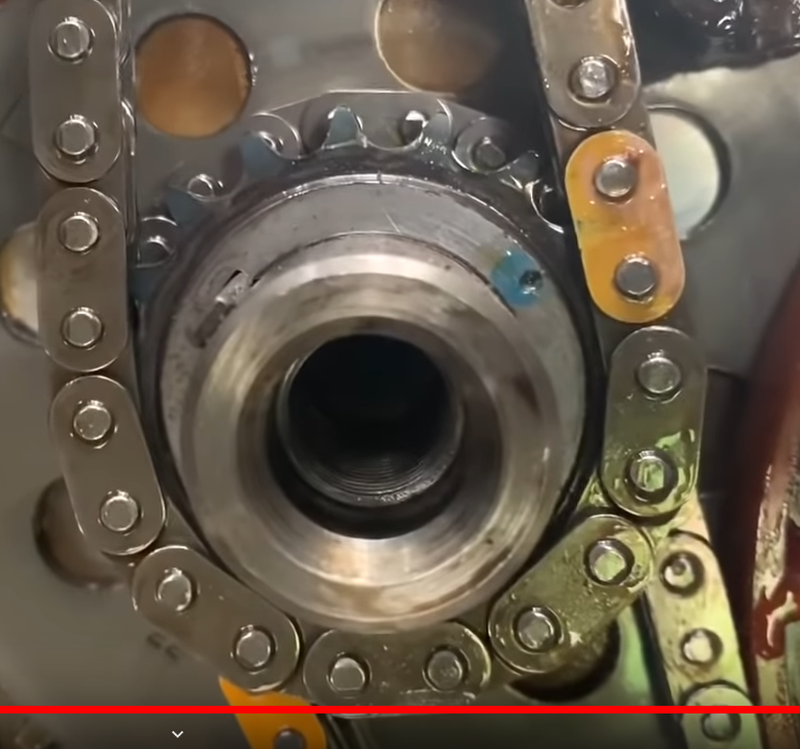 If that's 140 rollers in the chain and 36 sprockets on the cam, 140 = 2⋅2⋅5⋅7 and 36 = 2⋅2⋅3⋅3, the 2⋅2=4 is common to both, so it would take 140/4 = 35 cam revolutions to get all the way from aligned to aligned again, or 70 crank revolutions. Not sure why cnc is remembering ten. Kind of a pity Toyota didn't just make the chain four rollers longer (couldn't they? just make the tensioner a little deeper?). 144 would be an exact multiple of 36, and you could get from aligned to aligned again with just 4 cam revolutions (8 crank revs). On the other hand, thank your lucky stars they didn't split the difference and make it 142 rollers long. That would have no common factor other than 2, and you'd be stuck needing 71 cam revs, or 142 crank revs, to get from aligned to aligned. In the video they mention it just takes a few revolutions of the chain for everything to realign. "revolutions of the chain"? Maybe that's really what they meant ... how many times do you see the marked links come around the top of the engine? One revolution of the chain (140 rollers) is nearly eight revolutions of the crank (18 teeth). So you would need fewer than ten "revolutions of the chain" in the worst case (and typically fewer than five, if you didn't know where you were starting). Not sure why ten stuck in my head either. But I do remember rotating the crank until the marks came back together two times for sure. 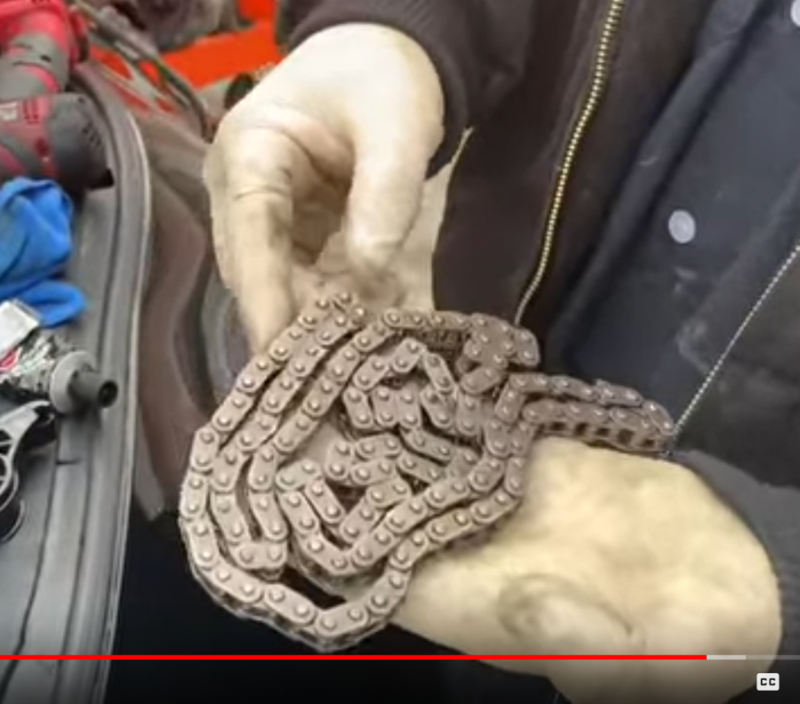 If we've got the tooth and roller counts right, it is indeed every 9th time the chain marks come around: one full chain loop is not a whole number of crank or cam revs, but 9 chain loops = 70 crank revs = 35 cam revs. Yes that's what they meant. Had to think, but yeah: when the chain mark came around about four times, you were back where you started. And with the spark plugs out you can get there pretty fast. It's about a third of the way into the video iirc. Now I've watched it. Yeah, he ends up at aligned on the second time around the chain. But that's starting from an unknown point (just wherever the engine last came to rest before he started taking things apart). Starting from an unknown point where the engine last stopped, you don't know how many turns away you are from alignment, but it'll be under nine times around the chain, and if you do the same job a bunch of times, you'll average around 4½, or 35 crank revs. If you ever were to start with the marks already aligned, it would take nine times around the chain (70 full turns of the crank) to get back there. I believe you Chap, cus my brain is full. Thanks for all the feedback! I now have just one more issue...I hope! I got all the marks correct and they tried to release the tensioner. I saw online that this can be accomplished by rocking the exaust cam bolt and listening for clicking in the tensioner. At that point, the chain tightened up. Then, I began slowly rotating the crankshaft bolt to ensure free movement of engine internals. All seems to move freely but the chain periodically is loose on top. The tensioner appears to be about halfway extended. I'm thinking of continuing to manually turn the crank untill the marks are lined up again and then remove just the tensioner and reset it. I definitely wouldn't crank the motor with this amount of slack in the chain.